First we need some dimensions - see the drawing above. This has some dimensions on it, but not all the dimensions we need - however, we can scale the drawing and read dimensions from it. Now I can start preparing the texture skin. I've allowed for two cab pieces - one for the front (outside of the cab) and another for the cab inside - this will need to be fairly high resolution as it will be close up when in cab driving mode. I need to stretch the boiler (and smokebox etc). From the notes above, I know the boiler is 2.92 metres long and 4.71 in circumference: so I resize the boiler section. At the moment it is 316 pixels wide, so I need it to be 316*4.71/2.92 in height - that comes out at 509 pixels. and I've still got a bit of room for more pieces (I'm bound to find some in due course) such as cab gauges and other controls. Scale varies (obviously) but it's helpful at this point to know that the cab (which is 2.15 metres wide) is 590 pixels wide (the whole image is 2048*2048 pixels). Now I can start in sketchup. Here I've created a rectangular panel in the position of the frames and textured it with my skin texture (not the scaled line drawing, but the composite of all the bits). I've adjusted the texture position to fit the frame. Next I use the push-pull tool to give the frame a bit of thickness. and again, use the push-pull tool to give this thickness. So far, it's taken me about two hours to prepare the textures and construct the frames. I've started texturing the boiler from the bottom - this way the "join" in the texture will be least visible. Notice also, that because I've put the boiler and the frames in different layers, I can hide the frames while I work on the boiler - this allows me to see the bottom of the boiler, which wouldn't be visible otherwise. As I said before, I've left space in the texture skin for anything else I need I find later. Here is an example, the smokebox needs some support - the smokebox saddle. 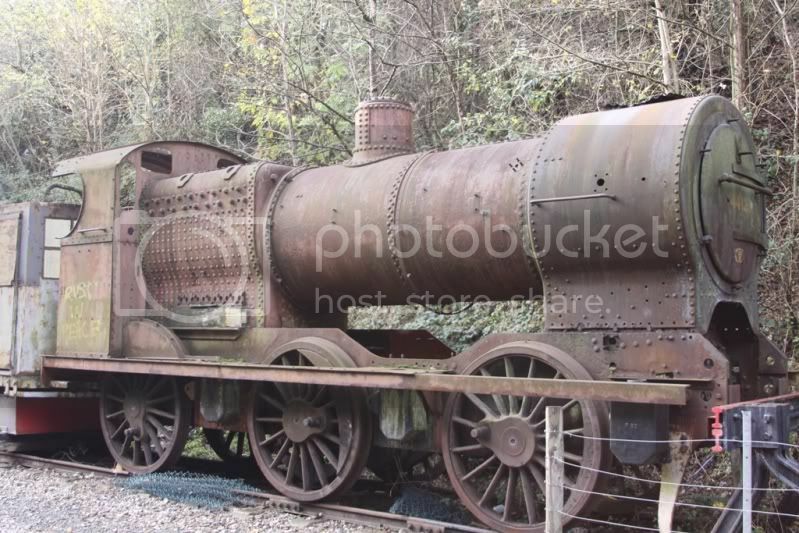 I did some more searching on the internet and found this image which shows the smokebox saddle and construction nicely. Ah, actually it shows something else as well - the frames extend higher than I thought - so I need to go back and extend the frames. Fortunatly this isn't too difficult and (more by luck than judgement) I have left the required bit of the texture skin in place - I meant to use it for the wheel splashers. and cutaway the inside, pushing the inside wall back into leave thin walls. The side shape is going to be difficult to cut out, so I'm going to do it a different way. I start be adding a guide panel lined up with the cab, but offset to one side, and with the scaled texture on it. I can fairly easily mark out the shape I want to cut-out on this flat panel, then I "push" that shape through the cab model. Now, I use the "Intersect with model" tool and the different surfaces cut where they intersect. Ok. Looking good. More to do, including chimney, dome and steps etc, but I'm ready to try exporting to Rail3D. Save the Sketchup file and export the model using the Rail3D export plug in. The sketchup file was called 4F.skp to the export will be 4F.stk. Open the Rail3D editor and rebuild the stock indexes so that the new file is detected. In my case Sketchup has created three components: "4F", "4F.0" and "4F.1". This way, any bits I create in Rail3D (like the wheels) will be safe from being over-written by another export. It also has the advantage that when I want to create another version of the 4F - the "Midland 4F" (or even the "S&D 4F") I can just copy and adapt the main top-level component and it can reference the same Sketchup export for the shape. Once I've saved the file, I can try the model in Rail3D. Ok, it works, but a lot more work is needed. For one thing some wheels would be a good idea. I usually create wheels using the Rail3D Editor tool (not always, I used Sketchup to make the wheels for the Bullied West Country - but they are a bit special). I need to add some balance weights to the wheels at some point. Now for one of the difficult bits: the dome and the chimney. The tricky bit is to get them to fit properly to the top of the boiler - the dome epecially has a complicated curve to it. That's the basic shape - and so far not difficult. The problem is how to make it sit on a curved boiler top properly. The next - and tedious job - was to apply a texture (actually just a black swatch, but still part of the texture) to the dome. It makes a nice fit. It's not perfect (I'm not going to tell you what is wrong with it) but it will do the job. As it is, it has taken as long to do just the dome as it took to do the boiler, firebox, smokebox and cab. Oh dear - it's bent the top as well :-( that won't do. You may wonder why I didn't just Sketchup's built in Black material for the dome and chimney. The Exporter only exports elements with bitmap textures - so anything using Sketchups built in materials won't be exported. If I use textures, it will be easy to make a different version later in a different colour - all it needs is a new skin. If I had used materials, I would have to go right back to the model to make a simple colour change. So, basically, I want everything to be textured from my skin. So, why is the chimney red? and use that to texture the dome. I used a different patch to texture the chimney (because I am aware of at least one variant of the loco where the chimney and dome were different colours). I'm only using red during the painting phase so that I can be sure of using the right patch in each case. Once I've finished they will both be black in the final model. The Smokebox front needs a bit of work. I made the coupling rod as a new model (because I will need to add it as a seperate component) by cutting out from the guide and the pushing pulling the various bits to get the shape I wanted. So, I export the models (the 4F body, and the coupling rod) to Rail3D .STK files and load up the Rail3D editor. I rebuild the stock indexes - so the editor picks up the new components, and open the 4F model. This simply gives a rotary motion to each crank, and then the crank calls the new Coupling Rod component using Motion1.